As much as I have grown to appreciate the convenience, safety, and, yes, beauty of much of the ICW, I am looking forward to finally reaching the deep, open water of the Chesapeake. Since entering the Okeechobee Waterway, back in Ft. Meyers -- a long, long time ago, it seems -- the chances to sail have been few and far between. A couple of long, lake-like sections in eastern Florida, a few days in the Carolinas when the wind blew just right and there weren't too many power boats around, and a nice stretch on Pamlico Sound. Those were the main chances, and I took them. But they are nothing compared to what lies ahead on the Chesapeake. Hundreds of miles of what is rumored to be some of the best cruising in the country. However, my anticipation is not without an edge of anxiety. 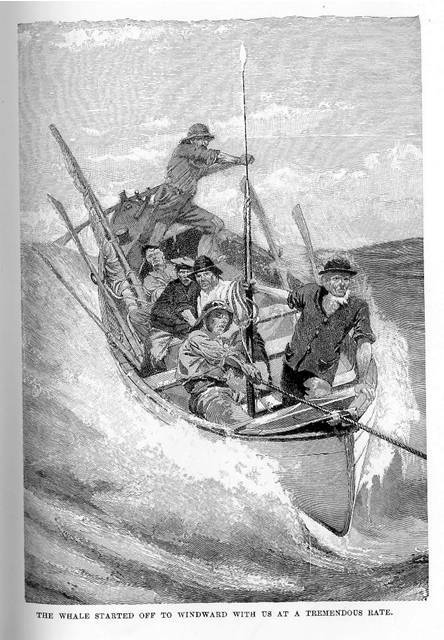 My last experience with open water was also the worst on this voyage -- a dreadful thrash across Albemarle Sound. All the guide books say the same thing about the Sound: a nasty bit of water; pick your time to cross. To start off with, the entrance to the great Albemarle from the Alligator River is a tortuously thin and twisting channel, hemmed in by shoals. I'd been warned about this channel and planned to follow the day markers carefully, as advised. However, it was a beautiful day and this so-called dangerous channel was surrounded by miles of open water. It just didn't look that threatening. As I approached the first marker, I noticed a 40' ketch right in the middle of the channel. She had all sail set and full, but oddly enough, didn't seem to be moving. For some reason, this aroused my curiosity. What was she doing? As I sailed within hailing distance, one of the ketch's crew members stood on the foredeck, waving to port and shouting something unintelligible. "Sorry?" I shouted back. "What's that?" More waving and shouting, with a bit of jumping up and down added in. "Eh?" I still couldn't hear. "YOU'RE RUNNING ONTO A SHOAL!!! GO THIS WAY!!!" At that very moment, the Blue Moon's keel bounced on what I knew from long experience to be hard sand. I shot a look at the depth sounder. 4 feet. Same as our draft. "Drat!" I said, or something in that line. I put the helm over hard to head in the indicated direction -- even though it seemed to be OUT of the marked channel. A risky move which I luckily didn't think about. A few more bumps and I was back in the channel and past the grounded ketch. I'm sorry to say that my hands and thoughts were too busy to even wave a thanks as I went by, but if the crew of that unknown ketch are reading this, thanks! "Well, that's the worst over," I thought, and headed out into the Sound. I had a lovely breeze on my port quarter with the main and foresail set, making about 5 knots. Just 10 easy miles across. I wondered if I could get some decent music on the radio. A half-hour or so later, I noticed that the wind seemed to be veering around into the west, and that a distinct chop had developed. This was precisely what the guide books had warned about -- a breeze blowing right down the Sound could kick up a nasty sea. The thought of heading back flashed through my head, but I didn't like the idea of threading that channel again. I told myself I'd be across the Sound long before a real sea had a chance to develop. Another half-hour, and we had ourselves a real Nantucket sleigh ride. Without the whale, of course. We were now in the middle of Albemarle Sound, so there was no thought of turning back, but there were more black clouds on the horizon. The northern horizon, to be specific. I didn't like to be pessimistic, but they sure looked like thunder clouds. With the approaching storm, the wind veered around right into the north, and so did the seas. The poor Blue Moon was now on her worst point of sail -- hard on the wind, with heavy seas. True to her lifeboat heritage, she rose easily to each sea, and her high bow defiantly flung most of it back into the face of the rising gale, but a fair bit of spray was making it back to the cockpit. I was once again glad to have my full fighting armor on. She also wasn't making much headway -- just 3 knots over the ground, according to my GPS. At that rate, the storm would be on us before we'd gotten across, so I fired up the engine to add a bit of ooomph to our forward progress. That helped bring our speed back up to 5 knots. We were now pounding into head seas and I knew I had to get most of my sail in before conditions got any worse. Double checking my safety line (which I always use in open water), I carefully crawled forward to take in the foresail and put a reef in the main. About half-way through this operation, I decided it would be easier and smarter to just drop the main and motor the rest of the way. This was the right decision, because the wind was soon on our nose and there was yet another tricky channel to negotiate at the mouth of the North River. Tacking through it was out of the question. So now the Blue Moon really was a lifeboat, and she did her job marvelously well. After my heart resumed normal operating speed, I actually started to enjoy the thrashing we were taking from Father Neptune. It had been awhile since he'd paid us a visit, and if the Blue Moon was in a defiant mood, well then so was I. Not the same storm, but this is what it looked like. Soon enough, we turned up into the North River and rounded Camden Point into relatively smooth and protected water. The black storm clouds had marched all around us, but thankfully never stomped right on top of us. A short sail later, we anchored in the lee of Buck Island -- the closest possible anchorage -- and I broke out the medicinal rum. If ever a sailor deserved a tot, it was me, I thought. I poured a bit over the side for Father Neptune, and then drank a toast to Tom Gilmer and his Blue Moon. So, if you ever cross Albemarle Sound, pick your time to cross!